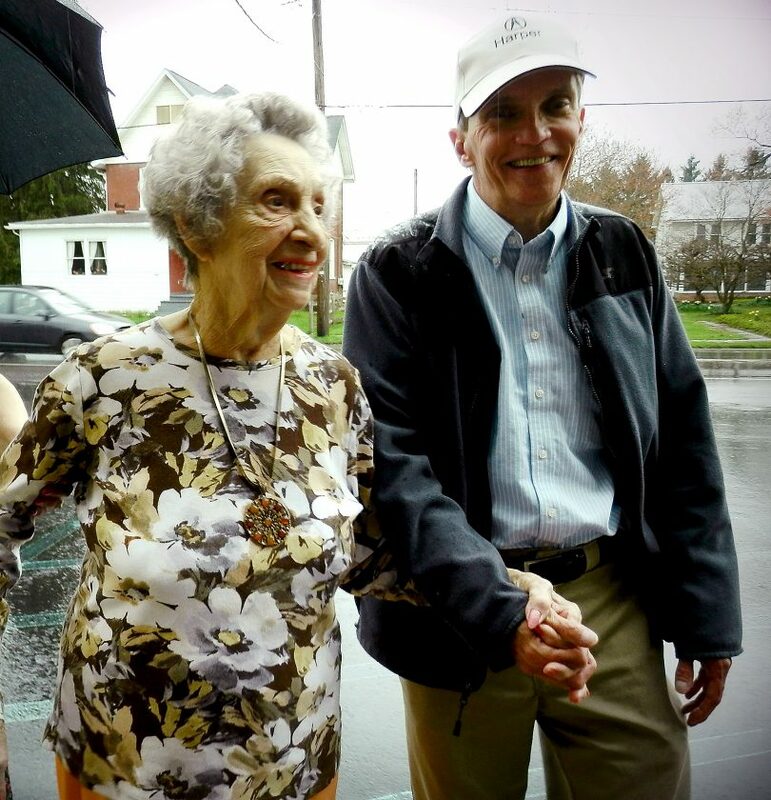 LANA MUTHLER/THE EXPRESS Florence Warren is escorted from her home to the Mill Hall Fire Hall by her nephew, Herbert Cunningham, who came from Tennessee to help his aunt celebrate her 100th birthday. MILL HALL — Florence Warren smiled often on Sunday afternoon. Wearing a sparkling crown on her head, it was indeed a wonderful day for the lady who celebrated her 100th birthday on April 9. “This is a real surprise,” Florence said as she sat front and center between old friends and neighbors, her seven grandchildren and their families at the Mill Hall Fire Hall. 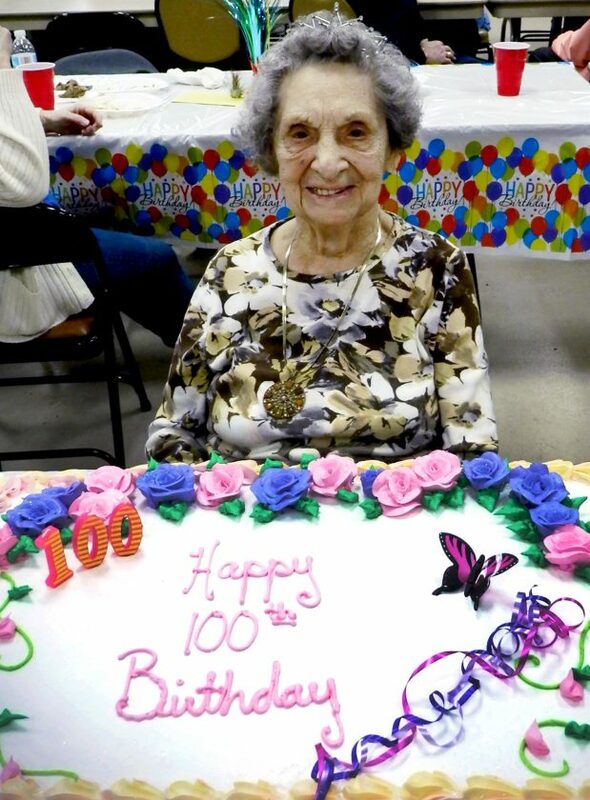 “I never thought I’d make it to 100, but here I am,” she spouted, a huge smile emerging on her face. LANA MUTHLER/THE EXPRESS A crown on her head and a smile on her face, Florence Warren prepares to cut her birthday cake. The first surprise came Sunday morning when her nephew from Kingston, Tenn., knocked on her door. Herbert Cunningham drove 10 hours to be with his aunt at this celebration. He said he didn’t want to miss this exciting day. Oh, she gets some help from her grandchildren, but is still very independent. Not as independent as she’d like however. It seems she “lost” the keys to her car a couple of years ago, her granddaughter, Carla Mantle said. “We had to take them from her,” Carla said. Asked about that day, Florence just smiled. So, what does she attribute her long life to? 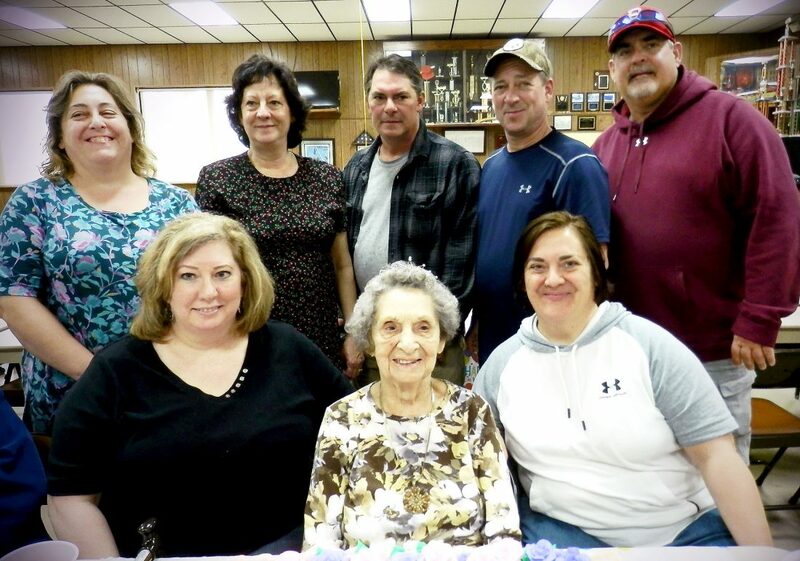 LANA MUTHLER/THE EXPRESS Florence Warren is surrounded by her seven grandchildren who planned a surprise birthday party for her on Sunday. From left are, front, Tracey Szostek and Sherrie Pick; back, Darlene Pick, Carla Mantle, Travis Pick, David Pick and Kenny Pick. “I grew up on a farm, lived in the country… and I eat dandelions at this time of year. If you don’t eat dandelions, you won’t life this long. You have to eat dandelions,” she said, adding that she just had a dandelion salad this past week. She topped the greens with her own special bacon dressing and piled them atop a smashed potato. “Oh, that’s the way to eat dandelions,” she said, a smile again crossing her face. She was born in Rote and grew up on a farm. 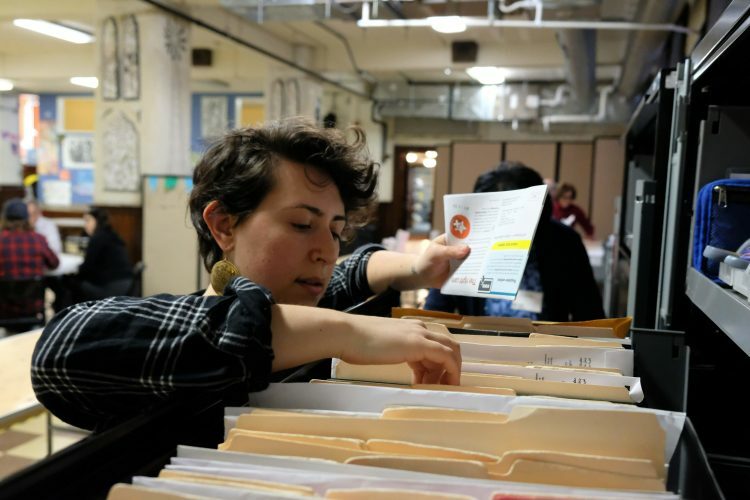 She graduated from the former Salona High School. Florence said she met her husband John when he came to this area from Tennessee to work for the U.S. Postal Service. She was the mother of three sons, Wayne, Larry and John, who are all deceased. She worked at Sylvania and then retired from Ames in Mill Hall at the age of 62. Carla said her grandmother is very independent and very stubborn. “She won’t let you do too much for her,” Carla said, noting that family helps her clean her house and takes her where she needs to go. “She still cooks and does her own laundry. Someone said she was out on the front porch one day recently washing the windows,” said Pauline Hunter, Florence’s 93-year-old friend who was among those congratulating Florence on her 100th birthday. Florence also enjoys flowers and has many flower gardens at her home. It’s not uncommon to see her out in her garden, taking care of them, Carla said. “I used to come over here at the fire hall and play Bingo every week. Now I can’t see so good… macular degeneration,” Florence said. About two years ago she fell on the front steps and broke her hip. She had a complete hip replacement. They said she’d never get back home. But after some rehabilitation she was up and walking again… and went home.” David said. Minutes later Florence strutted across the street to the fire hall from her home on the arm of her nephew using just a cane. “I don’t like walkers. They get in your way,” Florence said. As Florence sat down behind a beautifully decorated birthday cake with three candles — 100– you couldn’t help but notice her long and nicely polished finger nails painted a pretty shade of pink. “She loves to paint her nails. She keeps them so well manicured,” another granddaughter said. 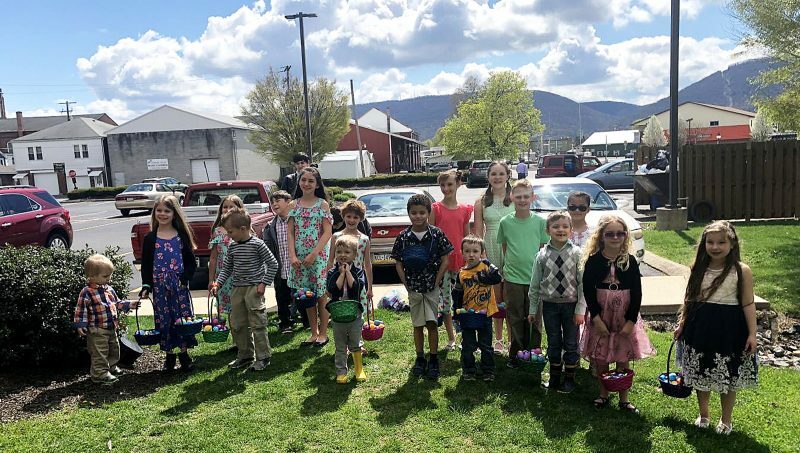 Besides her seven grandchildren, Florence has nine great-grandchildren and eight great-great-grandchildren and numerous nieces and nephews. “I never expected this,” Florence said, as she looked around the room as her well-wishers and flashed that beautiful smile one more time.